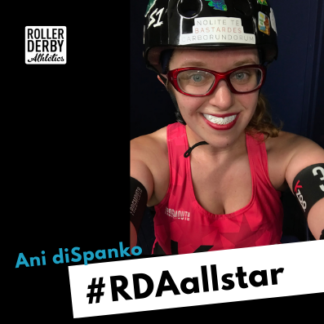 Introducing: Ani DiSpanko, of the Kalamazoo Derby Darlins Killa Crew B-Team! Spanko caught her coach Badbrand’s attention because in her most recent 12-week training plan, according to her training calendar she only missed…. wait for it… ONE workout!! That’s incredible! And her hard work is showing up on the track. What do you get up to when you’re not playing derby? I defended my dissertation in Ecology, Evolutionary Biology, and Behavior in the fall, so work involves research and teaching undergraduate biology courses. In my non-derby free time, I like board games and hanging out with my cat. What are you working towards in derby right now? We had our first home game a few weeks ago (which we won!). I definitely feel like my last couple months of training have improved my strength and stability as a blocker. We also experimented with a new blocker rotation this game where I ended up going out every other jam for most of it and it was nice not to have to worry about my endurance. I also appreciate that my captains and teammates have noticed some of these improvements and are giving me more opportunities on the track as a result! We’ve also preparing to host another edition of the K-Town Shakedown tournament in late April. Any big successes or milestones for you in derby recently? Last year was my second season with our B team. As the year went on, I found myself not only getting more playing time but also able to contribute more effectively on the track. Off the track, we hosted the first WFTDA North America East Continental Cup. How has off-skate training contributed to your derby experience? I wouldn’t have been able to grow as a player without off-skate training. When I first started with Kalamazoo, I had never skated before and did not have much of an athletic background — I was playing pickup soccer with friends pretty regularly that summer but hadn’t done any real strength training. Once I passed my minimum skills and started to fully practice and scrimmage with the team, I realized I needed to be doing something more than going to practice, but I didn’t know enough how to do it effectively. I saw an ad on Facebook for the Pump Up Your Jam program and I’ve been working with Roller Derby Athletics in some form or another ever since. Since I started, I’ve made a lot of improvement in my endurance, strength, and agility. Getting to the point where I didn’t go flying or get knocked down every time someone made contact has made a huge difference in my gameplay, and other people have noticed improvements in my stability and footwork. What is your favourite thing about training with RDA? Having a structured plan is really helpful for me and I’m more likely to push myself than if I’m just winging it in the gym. I also appreciate that it’s designed with roller derby in mind, so more focus is put on exercises that translate to what we need to do on the track. Since becoming a member, I love being able to check in with trainers like Booty Quake and BadBrand so we can periodically reassess what I need to be working on and structure my plans in ways that help achieve those goals. Do you have a favourite RDA workout? I don’t have one favorite, but I’ve enjoyed adding in more work with agility ladders this year, as well as shifting my strength training from primarily bodyweight to lifting. Anything else you want to tell the world about your derby or training experience this year? I’ve been laying the groundwork in offskates training and I’m seeing more and more of it translate to success on the track. I’m looking forward to continue putting in the work in both areas this coming year and seeing where it takes me! Congratulations to Ani on a great year, and thank you for being a fabulous rep for RDA into 2019! We are SO EXCITED here at RDA to watch what you do next! If you’re keen to see what YOU can achieve with some off-skate training and coaching from Roller Derby Athletics, check out our training plans.